All four taper designs: Level, Weight Forward, Double Taper, and Shooting Heads are found within Floating lines. The Weight Forward taper is by far the most common. The lines vary depending upon what type of fishing conditions and rod actions you are utilizing. The following table shows a sample of floating lines from Scientific Angler, Cortland, Rio, and Airflo. There are plenty more that are not listed as there are many floating lines specific for certain uses. These selections are based upon needs for All-Purpose, Spring Creeks, and Distance Casting situations. The "weight" classification is one that has been established by the manufacturers. For instance a WF3F is Weight Forward, 3 weight, Floating line. This line would be used with a 3 weight rod. By examining the lengths of the various head components and the running line, you can get a good idea how these components will affect the line performance. For instance, a distance casting head will be much longer than one designed for Spring Creeks. For years, the gold standard in the Scientific Anglers lineup was the GPX taper. Redesigned with more mass toward the front of the head, the MPX provides the same benefits of the GPX, with an added emphasis on presentation. The power is still there, only with an added bit of finesse.The Mastery Trout line is ideally suited for chasing browns, rainbows, cutthroats, and any other trout you can imagine. Trout excels in short-to-medium distances with dry flies and smaller nymphs and streamers. Expert Distance is an amazing trout fly line masquerading as a competition line. Designed with an extra-long head and rear taper, the Mastery Expert Distance is excellent in the wind, provides smooth distance casting, and lets you throw mends you didn’t think were even possible. The Mastery Short Belly Taper, or SBT, a short-bellied fly line with an extended handling section. That means more mass is distributed to the front of the line, which assists in turning over weighted flies and performing roll casts. This line also functions well for single handed Spey casts. Mastery Competition Nymph line is built to FIPS Mouche standards, but designed to simply catch fish, the Mastery Competition Nymph line is as simple as it gets: 80 feet of level line, in either a floating or an intermediate density. It doesn’t matter if you’re in an international competition, or just trying to outdo yourself, the Competition Nymph line will perform, fish after fish. Specifically designed for European-style nymphing, if you’re looking for the thinnest, most sensitive line available, look no further. Airflo came out with a new product in 2006, the Ridge Series. These are high floating lines with a ridged XT coating that minimizes the contact with the line guides on the rod. It also utilizes a TDC variable density technology that increases the floatability of the line tip. The Tactical line has a special taper for improved control and accuracy. The Distance line has a taper designed for distance and control at long range. Ridge technology is now extended into a specific taper Nymph line. The short front taper powers over heavy nymphs and indicators, while the long rear taper stabilises delivery and allows you to mend at extreme distance. Forty Plus is a line designed for distance with a short 36' head. It has a long front taper to delay turnover. The Sixth Sense line is developed with a very low stretch ability. This gives you smoother casting performance, positive hook sets, improved lift off and mending control. The Rio Indicator can be used for nymphing with indicators, high sticking, and dead drifts. It has a long back taper for rollcasting and spey casts. The Duo-tone tip acts as an indicator when High sticking or Czech Nymphing. The InTouch Trout LT (Light Touch) line is available in both double taper, and weight forward profiles, and features a long, fine front taper for the lightest of presentations and perfect roll casts. The ultra-low stretch ConnectCore provides groundbreaking levels of sensitivity for intuitively better cast timing, easier line lift and sharp, precise mends. Lack of stretch also means enhanced detection of subtle takes and faster reaction time when setting the hook. The InTouch Trout LT is perfect for fishing dry flies, nymphs and emergers. RIO’s LightLine has been designed to load slower, more traditional action fly rods such as bamboo, glass and the more “Classic” flexing graphite rods. Built to precisely match the industry line standards, this line will not overload such rods – even at longer range. The weight distribution and short front taper ensures the line loads at close range, making it ideal for fishing on smaller creeks and streams, while the softer, supple coating ensures the line remains relaxed and easy to handle in the majority of conditions. The RIO Gold has a special taper design that gives incredible loop stability at distance, a unique profile that allows a rod to load at close range and a front taper that delivers perfect presentation of flies between sizes #22 and #2. 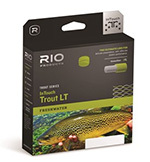 The RIO Gold is the ultimate all round, floating line for the trout fly fisher. The RIO Grand is a full line size heavier than the industry standard, and features more weight distributed towards the front of the line to easily load faster action fly rods. The line has a short head that is easy to cast, making it the perfect choice for fast action rods, or for more novice casters that like a little extra load to help them with the cast. The RIO Grand is built with "MaxCast" Technology, RIO's ultra-sophisticated line coating that actively repels water for higher flotation, longer casts and greater durability. The Trout Boss Features a complex new taper, thinner core and our new proprietary heat-tempered surface treatment Ultilizing a braided Nylon Multifilament core, the Boss is easy to cast with quick loading and high floatability. The 333 is a durable, high-floating, general-purpose fly line available in a weight-forward taper. Designed to perform well with modern medium- to fast-action graphite rods, the original 333 was the industry’s first modern PVC fly line and has been a popular choice among avid fly anglers for over 50 years. The 444sl is the original fast-shooting distance line and the first choice of expert fly anglers for over 30 years.The 444SL series has a little more stiffness than Cortlands other lines for increased distance. The Floating line comes in WF and DT. The Precision Trout line has a number of lines designed for trout within Springs Creeks to Big Rivers. The 333 Float has the "Rocket" taper on WF and DT lines. It is somewhat stiffer and overweighted for better use with fast action rods. The Classic line offers good, reliable performance and make an exceptional entry level line. With shorter, steeper tapers, the casting performance is more forgiving and ensures good turn-over of large flies at maximum casting distance. XS Plus Hi Float combines all the attributes of the current XS range, but in a Hi-Float coating. 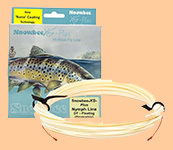 This ultra-buoyant material avoids tip sink, making it the ideal dry fly, or light nymphing line. In 2-tone Olive up to line #5 for river fishing and 2-tone Blue in weights #6, #7, #8 for reservoir fishing. Thistledown was primarily designed for river and light fishing on small stillwaters but is now a regular companion on almost any application where an angler enjoys lightweight finesse, stealth, and accuracy. With improved core technology when compared to the previous release, we can apply a slightly thicker outer coating, allowing the line to float higher while still having the same diameter. They last longer, but still have a profile and performance befitting its name. 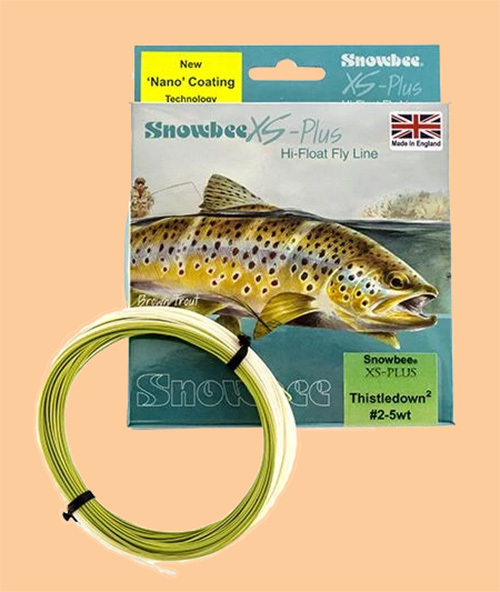 Like the Thistledown, XS Plus Nymph is also a single “Uni-weight” fly line with a mono core. It is a floating line designed specifically with river nymphing in mind. It boasts a short 6ft front taper, reducing to a fine 0.55mm diameter tip. The long, level belly is similarly slim at 0.65mm diameter throughout, before the matching 6ft back taper makes it fully reversible. Both tapers are high-viz Orange color for optimum visibility and “fine take” detection and feel. The reversible double taper line is 75ft in length and is micro-looped at both ends for finesse and immediate use. XS Float is the flagship of the range, without a doubt one of the best floating fly lines available today. The unique combination of ultra-low friction coating, superbly balanced profile, and outstanding shootability makes this fly line the line of choice to enhance the performance of the world’s best fly rods.